When most people think of the classic Mach 10, winger rails come to mind. However, the first generation Mach 10, shown here, was actually wingerless. Wingers didn't appear until the second generation. 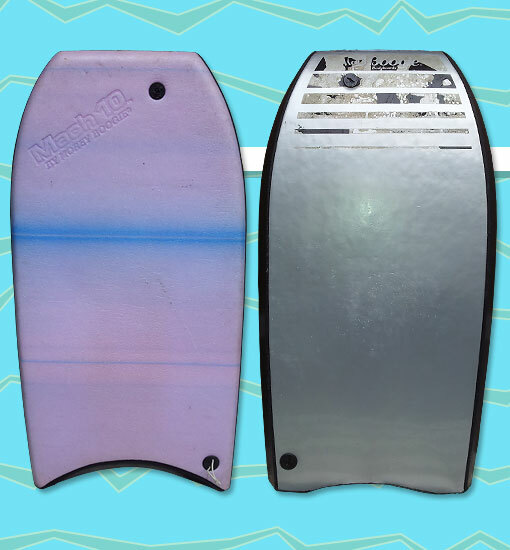 The Mach 10 came in two different colors - purple with a blue stripe (shown), and less commonly, blue with a pink stripe. Offered for two years, the original Mach 10 featured an overall larger template and three graphite stringers. The template was later used as the inspiration for the Mach 20 XL in 1989. Photo: Adrian Bray.